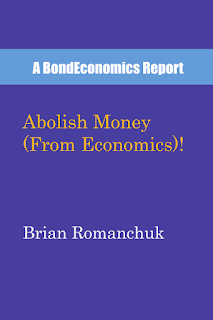 Bond Economics: Released: Abolish Money (From Economics)! Released: Abolish Money (From Economics)! Click cover for list of online sellers. My latest report - Abolish Money (From Economics)! - has been released in ebook format. (The paperback edition will be published within a few weeks.) The ebook is available at the same online booksellers as my previous books. We live in a monetary economy, so it is not surprising that money plays an important role within economic theory. The argument of this book is that this role has become too important, and has warped our ability to think about the economy. The important psychological role of money within society has been transferred to monetary aggregates, and they are given far more significance than they deserve. Economists have wasted considerable time discussing reforms to the monetary system, such as Quantitative Easing, Positive Money, and Helicopter Money. We need to instead focus our attention on non-monetary reforms. This book consists of 22 essays that discuss the role of money within economic theory, and the controversies raised by debates about the role of money. The tone is informal, as the theoretical debates are translated into plain language. The style of this book is different; it is a collection of short articles, a number of which previously were published in draft form online. (Even the articles that were previously published have generally been heavily modified.) The writing style is similar to my online articles, although I aimed to reduce the complexity of the writing. My feeling is a bibliography is not well-suited to ebooks, and so I have moved references to footnotes (endnotes). 2 Abolish Money (From Economics)! 8 Should We Care About Money Supply Growth? 12 Would Eliminating Money From Monetarism Have Stopped It From Jumping the Shark? 20 Should We Care About the Origins of Money?